Earlier this week, Google announced that it has expanded its Safe Browsing service, which prevents users from going to known malware sites. Chrome, for example, now shows you a warning before you visit a site that harbors known malware (instead of just popping up a warning when you are about to download it). Similarly, Google Search will now pop up a warning when you’re about to go to a known malware site, no matter what browser you use. 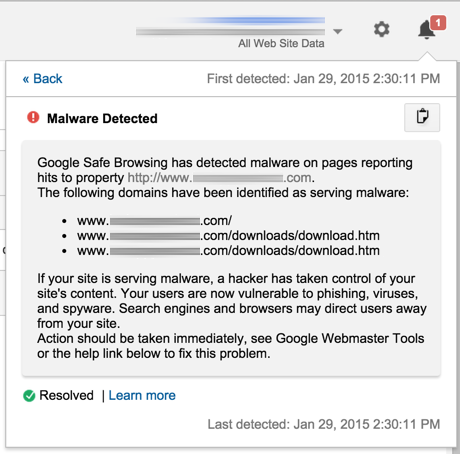 Before this, Google Ads already started automatically disabling ads that lead to malicious sites. Those updates solely focused on users, but the company also released an update for website owners today that makes it more likely for website owners to see when their own sites have been (potentially) compromised. Typically, website owners would only see those alerts when they visited Google’s Webmaster Tools site. While there’s plenty of interesting information to be found there, it’s not a service most website owners visit every day. Starting now, however, Google will also push these alerts to Google Analytics, which many more website owners check regularly. The malware warnings will now appear in Google Analytics’ notifications bar (which is very similar to the standard Google+ notifications service). Ideally, of course, Google would show those alerts to webmasters in all of its tools (the Google+ notifications tool, after all, is ubiquitous in the company’s web apps). There doesn’t seem to be a way to connect Google+ profiles with the Webmaster Tools, though, while there has long been an integration between those tools and Google Analytics.